With the Year of the Rooster neatly wrapped and the Year of the Dog well underway, the Vancouver Economic Commission’s (VEC) Asia Pacific Team (APC) is pleased to share an overview of some of our activities in 2017, and to note some milestones and investments that occurred as a result. Since the conception of the Asia Pacific Centre, the team’s work has consisted of conducting and receiving business missions, FDI attraction, liaising with foreign investors, and facilitating B2B and business dialogues. As such, our highlights in 2017 may be broadly grouped into the categories of business outreach, successful FDI outcomes, engaging our local business communities, and convening with a purpose. Here are a few highlights we were particularly proud of from the Year of the Rooster – some of which we hope will bear fruit in the Year of the Dog. From September 5 to September 9, a delegation of businesses, academics and government officials journeyed to Beijing and Shanghai in China with the primary objectives of representing and promoting Vancouver’s innovative, creative and sustainable business sectors, attracting investment to support Vancouver’s knowledge economy, and assisting the expansion of local companies into the Chinese market. Read the full story. During the five-day roadshow organized by Global Affairs Canada in March, the APC had a packed schedule of over 30 meetings across Beijing, Tianjin and Qingdao. These included site visits and B2B meetings with local business leaders of the three cities – with subsequent success! During the Qingdao B2B meetings, the APC team had its first meeting with Qingdao Hengda Glasses – a glass technology research enterprise with 20 years’ research history in the vacuum insulating glass (VIG) technology field. With VEC’s support, and through the Embassy of Canada in Beijing, Hengda made the decision to establish an office in Vancouver and to invest CAN$12 million together with its partners – a move that will create 50–100 jobs in Vancouver. Bloomage International Investment Group Inc.
2017 marks the 150th year of Canada’s birth. APC staff participated in the 150th Canada Day Fair hosted by the Canada–China Business Council’s Beijing Chapter, which sought to promote Canadian brands in China while promoting ties between the people of the two countries. The VEC’s close relationship with the Chaoyang District Government of Beijing is exemplified by the annual Canada–China Business Forum. Beijing BDStar Navigation Co., Ltd. (北京北斗星通导航技术股份有限公司) (SHE: 002151), through BDStar Investments (Canada) Co., Ltd., has completed previously announced acquisition of Rx Networks Inc. for $31 million of all cash consideration, subject to a 20% holdback of the consideration for a period of two years. The acquisition was announced on March 27 and closed on August 3, 2017. Rx Networks is a venture-funded technology company located in Vancouver, BC. (source)The VEC and BDStar signed an MOU of increased cooperation in 2017, and VEC has since made good on this agreement by providing support to BDStar in their expansion efforts to Canada. The expansion includes investments in the areas of location-based services (LBS) and Internet of Things (IoT). As this collaboration continues, VEC will continue to provide guidance and assistance to BDStar in areas such as talent recruitment, government policy, community relations and collaboration with Vancouver businesses. Aupera Technologies Inc. is a technology innovator that builds intelligent computing and storage systems, with a focus on optimizing video data storage, processing and analytic applications. With APC’s support, Aupera signed MOUs with Beijing’s Speedycloud Technology Co., Ltd. and Shanghai’s PPTV in their respective cities.SpeedyCloud Technology Co., Ltd. provides state-of-the-art Internet and Enterprise IT-related IaaS (Infrastructure-as-a-Service) cloud computing infrastructure products and services. In signing the MOU, SpeedyCloud agreed to work with Aupera to provide optimized system solutions for the Cloud Video Sector. PPTV is a Chinese video streaming website, and will partner with Aupera in technologies, products, services and total solutions in all links of Cloud video service and its relevant fields. MUJI takes its name from an abbreviation of Mujirushi Ryohin, which translates to “no-brand quality goods.” The quality of these famous goods has seen almost universal appreciation by consumers around the world. MUJI describes their products as resource-saving, cost-effective, minimalist and showing appreciation for the environment. The 7,000-strong catalogue selection features a wide range of products, ranging from household items to clothing to even constructed homes.MUJI opened its flagship store in December 2017 on Vancouver’s famous shopping district Robson Street (taking some pressure off a popular location opened earlier in the year in Burnaby’s Metrotown). With the assistance of the City of Vancouver and the Vancouver Economic Commission, MUJI Canada was able to overcome several construction hurdles to stay on schedule – much to the delight of throngs of crowds on opening day. The APC team has been building up relationships with the Korean communities in Vancouver since its establishment in 2014. The APC participated in outreach mission trips to Korea, met up with the Korean Consul General and other government officials, and invited them to APC’s Canada–China Business Forum. The APC also partnered with KOTRA in the 2017 IT Tech Roadshow. Learn more about VEC and the Korean community. Besides Korea, The APC also maintains great relationships with Taiwanese communities, regularly attending various celebrations and business events. The APC was particularly active in building up business relationships with ASEAN communities in Vancouver. This included hosting government delegations from Indonesia and Thailand. Learn more about ASEAN. 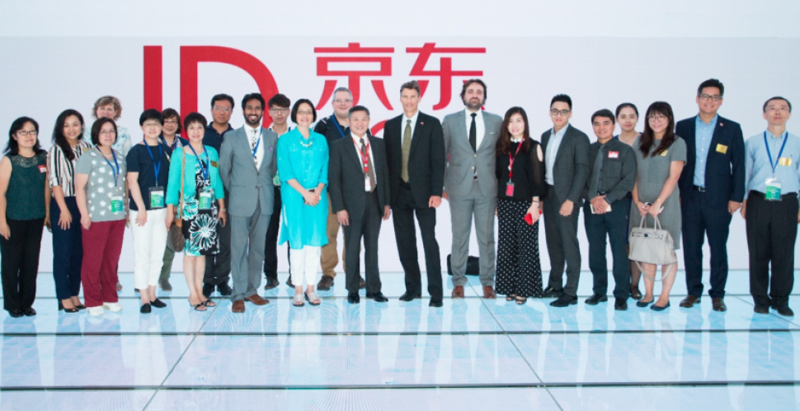 Last summer, the VEC hosted JD.com – a Chinese e-commerce giant headquartered in Beijing. This event drew a large and engaged audience from both Canada and China’s e-commerce community. The VEC was later invited by JD.com to visit their headquarters in Beijing in September 2017 and signed an MOU during the meeting to cement the relationship. Read about the event – and some takeaways of the day you should know if you want to tackle the Chinese market. APC and 1898 Business Club co-organized the workshop “Supporting Innovative Business in Vancouver.” This workshop drew 80 entrepreneurs and investors interested in learning more about the SR&ED and Mitacs programs. On April 18, 2017, the VEC hosted a consultation roundtable discussion on a possible Canada-China Free Trade Agreement. Several dozen business leaders, Canadian stakeholders, industry associations, experts and academics, University Alumni Associations and individuals showed great engagement and participation. As always, APC is eager to continue broadening its scope and deepening its impact. We have many plans in the works for the upcoming year, and look forward to telling you all about them in our next debrief. Meanwhile, we welcome you to give us your perspective and suggestions by email to ssong@vancouvereconomic.com. Thank you!